The door width requirement for single wheelchair access is 32 inches, as noted by the Americans with Disabilities Act. 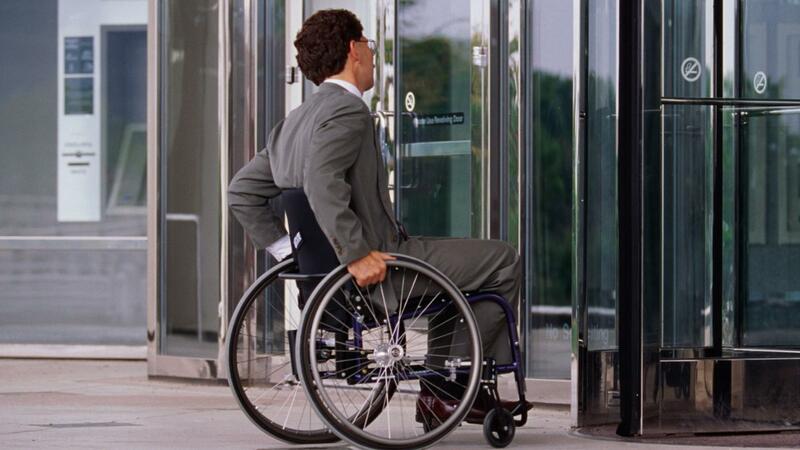 The minimum door width for two wheelchairs to pass is 60 inches. The minimum amount of space required for a person in a wheelchair to make a 180-degree turn is 60 inches. Most doorways measure at 23 to 27 inches in width, which is not wide enough for most wheelchairs. For businesses who have to remodel their access ways to accommodate the ADA, there is a Specialty Adapted Housing Grant that helps pay contractor fees. In addition to making the doorway wider, an electrician may be needed to rewire any electrical wires that are moved.